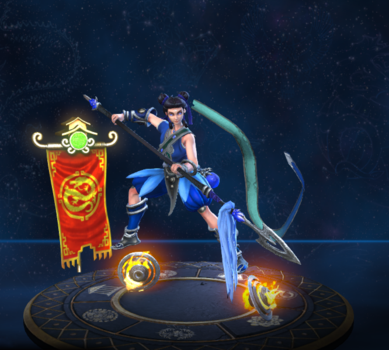 Ne Zha is one of the playable Gods in SMITE. Grants 10% Movement Speed at max stacks. Has a bounce range of 50. Prioritizes targets that haven't been hit. Grants up to 20/25/30/35/40% movement speed. Can potentially reduce up to 30/45/45/60/60 Protections to one target. Can heal up to 15% of Ne Zha's health. The critical hits are affected by Deathbringer. There is a short immunity frame while Ne Zha is pulled to his target. The timed attacks are performed by basic attacking. As Ne Zha stun an enemy using Armilary Sash and then ult them. Ne Zha was the first god to have basic attack progression. The actress who voiced Ne Zha, Colleen Clinkenbeard, also voiced Arachne and Modern Mercenary Nemesis. 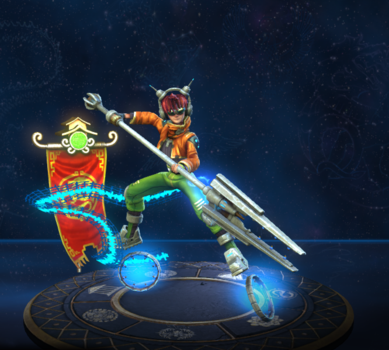 One of Ne Zha's jokes, "Man, my wheels are so hot! ", could be a reference to the toy car brand Hot Wheels. 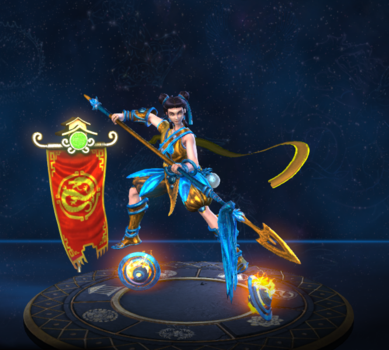 in December of 2015, Ne Zha received a remodel changing his Default, Blue Lotus and Mastery skins, his Cyberpunk skin received minor adjustment to fit into his new rig. This skin could be a reference to the Jet Set Radio videogame series. 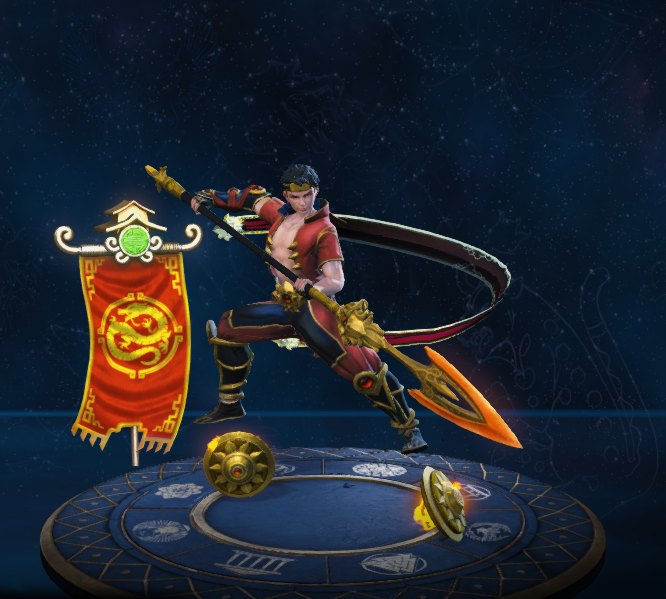 This was the first skin released after Ne Zha was remodel. 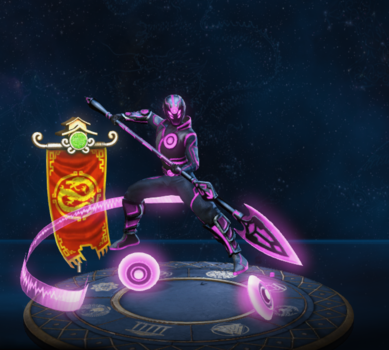 This skin is a reference to the movie Tron: Legacy. This skin share its theme with Hun.BAT Hun Batz, Run.EXE Mercury, Sun.GOD Ra and Jag.RAR Xbalanque. 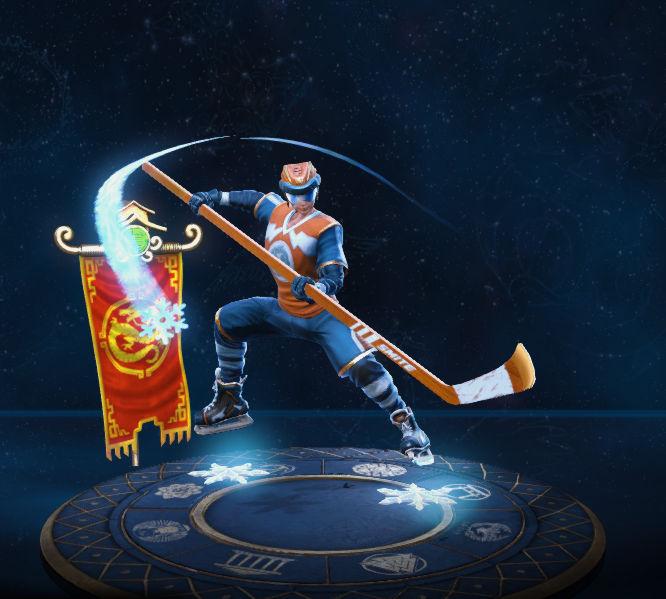 This skin is based on a Hockey player. The actor who voiced this skin, Alejandro Saab, also voiced Beamy Chibi Ra and The Marksman Rama Rama. This skin can only be obtained by reaching level 25 in the Season Ticket 2017. Decreased Protection Debuff from 15 to 10/11/12/13/14. Buff stacks no longer provide Critical Strike Chance. 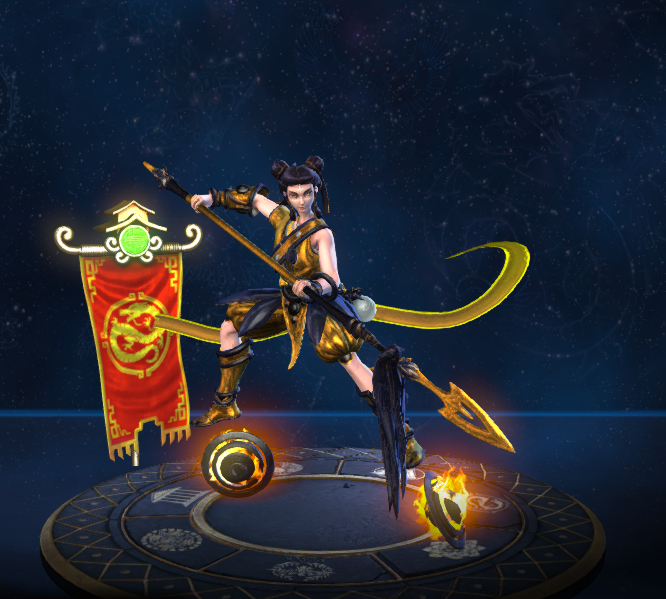 Ne Zha's Armillary Sash will no longer go on cooldown if interrupted before it has any gameplay effect. Updated the description to accurately state how much damage this Ability deals. Fixed an issue where this ability would consume no mana if used in Melee range. Updated the visual presentation of the “Critical” circles. Ne Zha gains stacks from successful Basic Attack and ability hit, and 2x stacks from Critical Hits. Each stack provides him with .5% crit chance. Stacks are lost after being out of combat for 5s. 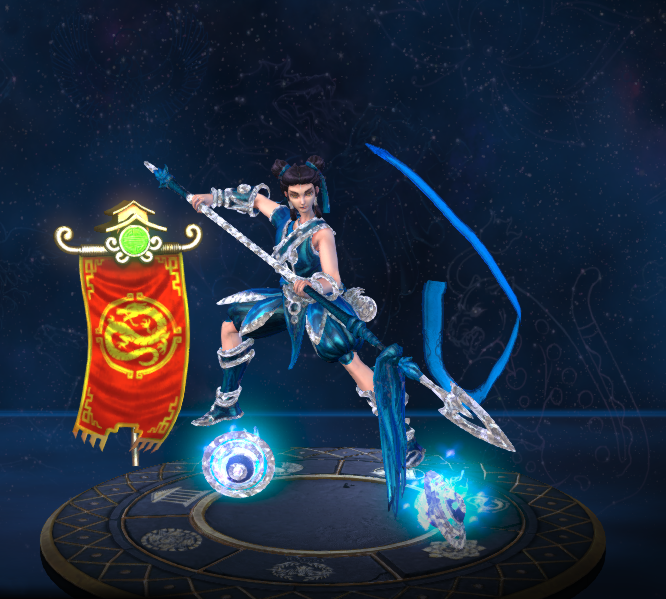 Now heals up to 15% of Ne Zha's maximum HP depending on how many stacks of Righteous Spirit he has. (0.75% HP per stack). Fixed Ne Zha Ultimate background fx persisting on gods. Ne Zha received a complete visual overhaul. Fixed being able to go inside towers after using on target. Fixed a visual issue with the timer on the icon stacking. Immortal Spirit has been reworked into Righteous Spirit. Ne Zha gains a stack when he hits an enemy with a Basic Attack, and an additional stack for Critical Strikes. He may activate Flaming Spear to consume these stacks and heal himself. Heals for 1.25% per stack, max. 20. Fixed not dealing damage if hitting crowd control immune targets. Fixed an issue where using the ability on Janus while going through a portal could cause both players to get stuck. Fixed a bug that could leave him revealed to enemy players. Updated targeters for Cyberpunk skin. Fixed a number of animation issues, including recall. This ability now inherits Ne Zha's critical hit chance and can critically hit when Ne Zha lands at his target location. Width of sash grab increased from 10 to 12. Fixed an error in the tooltip. Now properly indicates this ability is a buff that affects only Ne Zha. Post-Hit Delay reduced from 0.5 to 0.2. Fixed an issue where Ne Zha would slide to the target. Fixed a major bug with Ne Zha's Ultimate. Ne Zha is now immune to root effects while dashing. Ne Zha’s immortal spirit cannot be suppressed. All successful basic attack hits increase his HP5 (0.5 per stack, up to 50 stacks). All stacks are lost on death. The damage reduction for subsequent hits has been reduced from a 30% reduction to a 25% reduction. This ability can now bounce to each target multiple times again. This ability now deals 30% reduced damage on each subsequent hit on the same target. This ability no longer bounces to the same target twice. Fixed an issue with his Ult where players could get caught on top of map walls. Fixed an issue with Armillary Sash and Fenrir Ragnarok interaction. Increased bonus attack speed from 15/20/25/30/35% back to the original 15/25/35/45/55%. After further evaluation of his performance after the Attack Speed bug fix, we determined this earlier nerf was no longer needed. The physical power contribution of this ability has been reduced from 150% to 100%. Number of bounces decreased from 5/6/7/8/9 to 3/4/5/6/7 (-2 off all ranks - total number of hits is what's listed here +1 for the initial hit). Damage per hit increased from 50/70/90/110/130 to 75/100/125/150/175. Physical scaling increased from 15% to 20% per hit. Physical protection reduction per hit increased from 10 to 15. Move Speed buff for Ne Zha increased from 4% per stack to 5% per stack. Physical Scaling increased from 50% to 150%. The description for this ability was incorrectly displaying a 150% contribution. It has been corrected to 50% to match the actual contribution in the game. Ne Zha has been added to the game. At max stacks, Ne Zha's passive will heal him for 25% of his maximum health.